If a hoist ring and a machinery eye bolt had a baby, this would be it. 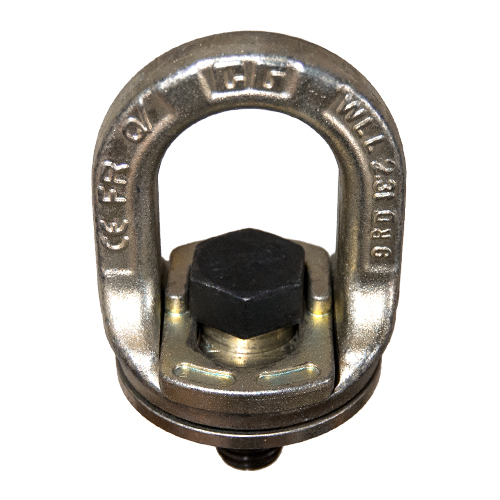 One common problem for riggers is that eye bolts do not offer enough flexibility (no swiveling and angular loads greatly reduce capacity), and hoist rings are often too expensive for a given job. Crosby recognized this problem and came up with a great, unique solution. Enter the SL-150 Slide-Loc Lifting Point. Quite the contrary, in fact, we don't think it could be any easier. To install the Slide-Loc, make sure the red indicator is showing, which means the bolt and bail are engaged. Simply hand tighten the unit, no special tools required. Move the tab to cover the red indicator, and allow the bail to swivel while under load. The Slide-Loc is now ready for use. To remove, simply move the tab to expose the red tab and unthread the Slide-Loc from its installation point. Check out the bullet points below for informational highlights, and check out the Video and Attachments tab for further information.